The photo above was taken while a gift quilt was on my couch in Ohio but I packed it up and sent it to my dear friend, a "mad English gardener" who happens to have moved to Scotland. She sold her home in England that had the loveliest perennial garden I had ever seen and I felt that she needed to have a beautiful garden that she could have with her forever. 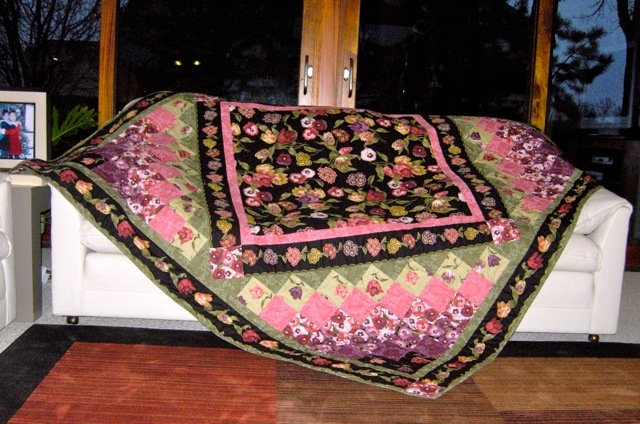 This quilt made from kit from Keepsake Quilting certainly "hit the spot" because her thank-you email arrived today and it was heartfelt and enthusiastic. Hello everybody. I still haven't basted my second memorial quilt together. It is all placed together ready to go, but I'm still dragging my feet on it. I plan to go through my fabrics in the next week or two to clean, organize, and pull out stuff I no longer want. If anyone is interested in whatever fabrics or scraps I might decide to part with, send me an email with fabrics etc. in the subject line. lightningsj, AT, ATTDOTNET I'm sure you all know to remove the spaces and commas. I posted this on the other page, though I'd ask here also. Do any of you use, or have the sew ezee sewing table to take to classes, or retreats? Or another brand? A small portable table on wheels. I'm thinking of buying one, but wanted some input. The Sewezee brand is about $250.00, there is another brand the Gidget, which is $179.00 and seems to be about the same.